According to legend, Krampus accompanies Saint Nicholas during the Christmas season, warning and punishing bad children, in contrast to St. Nicholas, who gives gifts to good children. When the Krampus finds a particularly naughty child, it stuffs the child in its sack and carries the frightened child away to its lair, presumably to devour for its Christmas dinner. A lump of coal? Forget that - Krampus is going to eat you, bad kiddies - so be good! 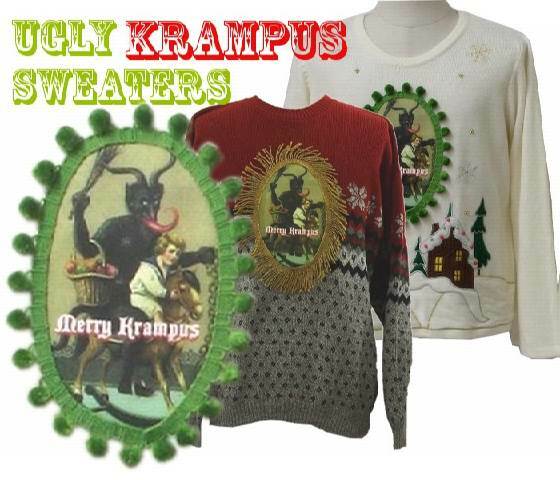 But our favorite Ugly Christmas Sweater creation by far is our UGLY KRAMPUS SWEATERS for men and women!